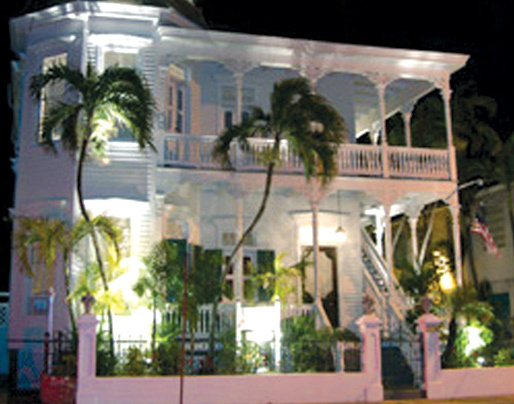 A Historic Key West Guest House in Old Town, Key West, Florida The Artist House, at night From the moment you open the gates of The Artist House, you enter a world of hospitality and whimsy that will haunt you for months after your Key West getaway is over. Our historic Victorian Guesthouse features stately rooms that have been recently remodeled and elegantly furnished. Please visit our rooms and rates pages for more information on our beautiful accommodations. Learn more about the famous Artist House by visiting our About Us page and our History page. The Artist House is within walking distance of Duval Street and Old Town Key West restaurants, bars, art galleries and attractions. About The Artist House The Artist House, exterior The Artist House is a restored, Victorian mansion, a true world famous masterpiece in the center of Old Town, just steps from the famous nightlife, water activities and beaches. Virtually no other Inn on the island is as true to its original design, layout and character. Indulge yourself in spacious, antique-filled rooms with 12' ceilings, richly-detailed original design wall coverings, splendid woodwork and private baths. Relax with a complimentary continental breakfast in our lush tropical garden. The Artist House, patioThe Artist House has been operating as an island favorite since 1978. We are one of the oldest continually operating guest houses in Key West, and have developed quite a satisfied following. Today, many of our guests have stayed with us repeatedly throughout the years, and have graciously recommended us to many others. Our History a painting of The Artist HouseBuilt between 1890-98, and formerly the home of the celebrated Key West painter, Robert Eugene Otto, and his wife Anne, a concert and jazz pianist, The Artist House is an architectural gem. Its Colonial Queen Ann style, with numerous graceful columns, verandas and gingerbread, is highlighted by the magnificent presence of its turret. One of only a mere handful of authentic, truly original buildings on the island, and all of Florida, The Artist House is considered by many architectural historians as one of the "great" historic homes on the island. Evidently, visitors and locals to the island seem to agree ... with the exception of the "Hemingway House," The Artist House is probably the most photographed and illustrated home in Key West. It is a centerpiece of conversation among the Historic Walking Tour, the Historic Bike Tour, and featured prominently on the world-famous "Conch Train" and "Trolley" tours. We are even on the Ghost Tour, although none of our thousands of guests have reported anything but a wonderful stay. The Artist House, staircaseTelevision credits include recent appearances on world-wide broadcasts of THE DISCOVERY CHANNEL, A&E TELEVISION, ABC TELEVISION'S "GOOD MORNING AMERICA", THE CBC (Canada), and HOME & GARDEN TELEVISION'S "EXTREME HOMES". Recent essays of The Artist House have appeared in: NEW YORK MAGAZINE, THE MIAMI HERALD, THE LADIES HOME JOURNAL, THE TAMPA TRIBUNE, and countless travel books both foreign and domestic. As interesting and appealing as the building, is the history of the Otto family that built The Artist House. Mr. and Mrs. Thomas Otto, both native Key Westers, formally moved in to the grand home on Eaton Street in 1898. The youngest of three sons, Robert Eugene Otto would eventually inherit and live in this beautiful structure. From designing brick gardens and staging flower shows to personally hanging mounted fish in the museum in Mallory Square, Gene Otto worked for and in the city of which he said there was none better. Gene, as friends called him, studied at the Academy of Fine Arts in Chicago and the Art Students League in New York before traveling to Europe where he developed a personal style decidedly his own. He was abroad for eight years and spent the last four at the Academy Julienne. It was while painting and continuing his studies in Paris that he met Annette Parker, a native of Boston, who was studying music there at that time. They were married in Paris on May 3, 1930. portrait of AnneAfter Anne finished her studies in Paris, the couple moved to New York for several years. During this period we understand that Anne performed at the celebrated Rainbow Room at Rockefeller Center, indicating that she had become quite an accomplished pianist. Several years later, the Ottos moved back to Key West, where Anne dedicated her time to more domestic aspects of life at 534 Eaton Street (the home address that Anne would come to love). Anne frequently worked as a volunteer during the 40 years that she called Key West home. She and Gene were fond of animals, especially their Yorkies ... three of whom are now buried alongside the couple at the Key West Cemetery. In his later years it seems that Gene Otto was better known for his stories of "enchantment and spirits," than for the art he loved. However, Gene contributed much in the way of world-class art, and was also a civic activist. He pioneered a level of interest in architectural renewal and restoration in Key West that later exploded into a citywide effort that continues today. It is not by chance that The Artist House is preserved as it was 100 years ago ... Gene died in 1974, and Anne two years later. But they live on in his art, in their beautiful and beloved house and garden, in the civic projects they undertook and even in the stories of "enchantment" that are passed along from person to person. The spirit and the influence of Gene and Anne and the entire Otto family are still very much a part of the fabric and foundation of The Artist House, and the City of Key West as well. The building, antiques, garden, and "spirit" of The Artist House are a treasure for everyone to enjoy. We hope to see you soon.